TASHKENT (Uzbek MFT press service) — The Uzbek Ministry of Foreign Trade (MFT) is confident in the exclusion of Uzbek cotton from the black list of US goods. "The US Department of Labour has published new reports on child labour, which indicate an improvement in the situation in Uzbekistan, and simultaneously released an additional report titled A list of goods produced by child labour or forced labour, the ministry’s press service said. The ministry noted that this annual list is being published for the eighth time already. Uzbek cotton got into it in 2009, when the list appeared for the first time. “This decision will positively influence the image of Uzbekistan in the world opinion and will open the way for possible cooperation with leading foreign brands in the textile industry (Gucci, Louis Vuitton, H&M, OGGI, Adidas, Nike and others)”, the press service of the Ministry of Internal Affairs . It is expected that this year representatives of the Cotton Campaign will visit Uzbekistan to monitor the cotton campaign. Speaking in September 2017 at the UN General Assembly, President of Uzbekistan Sh. Mirzayev had confirmed the firm intention to solve the problem of forced labour in Uzbekistan. 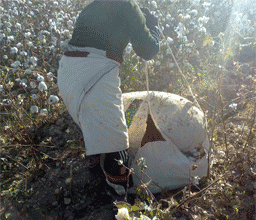 Therefore, in 2018, Uzbekistan took a number of measures to prevent forced labour in cotton harvesting. In particular, monitoring has been strengthened to prevent forced recruitment, widespread information campaign among the population, new mechanisms for accepting complaints against illegal actions of officials have been launched, and labour remuneration rates for cotton pickers have been raised.